As we gather to discuss the challenges facing world towns and neighbourhoods, Blachere Illumination believe that modern approaches to lighting could play a key role in unlocking potential opportunities. 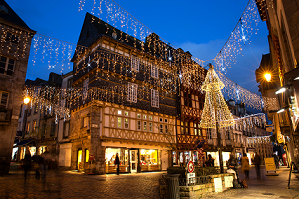 As the world’s leading manufacturer and supplier of festive lighting, Blachere has established a global reputation for delivering innovative lighting schemes, not only for the traditional festive period but a growing all year round approach. Their total approach to lighting, from design through to installation and dismantling, includes total control over quality and lead times and provides a unique offering in the market. And with over 40 years in the business, they have built a wealth of knowledge which continues to deliver results. Blachere’s global position in the market is reflected with offices in 19 countries and projects delivered in over 150 countries with a corporate client base which includes the likes of the Mandarin Hotel, Saks of Fifth Avenue and Euro Disney – not to mention some of the biggest Christmas lighting displays for city centres around the world. Festive lighting has continued to present a challenge for town centre managers and BID managers, however, there is no question that their presence not only transforms the atmosphere in the area but it is proven to also increase footfall at this critical period. 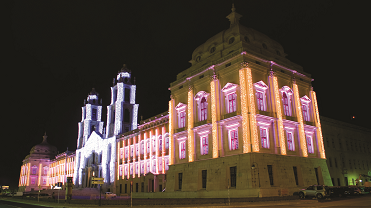 To make festive lighting more accessible and manageable, Blachere has been at the forefront of the industry launching solutions such as its ‘hire scheme’, ‘creative kids scheme’, which encourages private and public sector co-operation and full turnkey solutions to minimise the risk on all parties. Blachere’s client focused and innovative approach has seen its expertise now being called upon to assist in a wide range of lighting projects. One of its fastest growth areas is its ‘Winter Lighting Solutions’ which is focused on tree dressing, ceilings of light and architectural lighting to transform prestigious buildings and stately homes. These types of projects are providing year round lighting to town centres to breathe new life into their night-time economy. However, one of Blachere’s most exciting developments has been its projection mapping solutions which uses highly sophisticated technology to bring buildings to life with stunning animations and effects. These can be used as a highly effective marketing tool to communicate branding or to become the focal point of a major event. But the secret to developing an effective lighting solution is in the design and project management. Blachere’s experienced project managers can assist at every step of the process, helping you to create the perfect brief, liaising with our design team to create a stunning lighting scheme that provides the wow factor within the specified budget, and then taking full control over project delivery. Blachere offers an extensive product range that not only meets the latest CE regulations but which has also been instrumental in establishing their reputation for delivering high quality solutions that are both reliable and durable for many years. With a full 12 months warranty on all products supplied, you can enjoy complete peace of mind knowing that your installation will continue to perform. To find out more, visit www.blachere-illumination.co.uk or call our customer service team now on 01337 832910.